Congratulations to our JV Volleyball Lady Knights on achieving an UNDEFEATED season tonight with wins over OLBS! Awesome play and teamwork by Carly A, Cara M, Macey K, Lynn N, Ruby N, Charlotte M, Claire T, Rebecca S, Monica K and Aniella P.
Thank You to Coach Tracy A, Coach Joy A, and Coach Patrick Y for your all your hard work getting the girls ready for every game! And what better way to celebrate an awesome season than a surprise team trip to Anderson’s with their coaches! 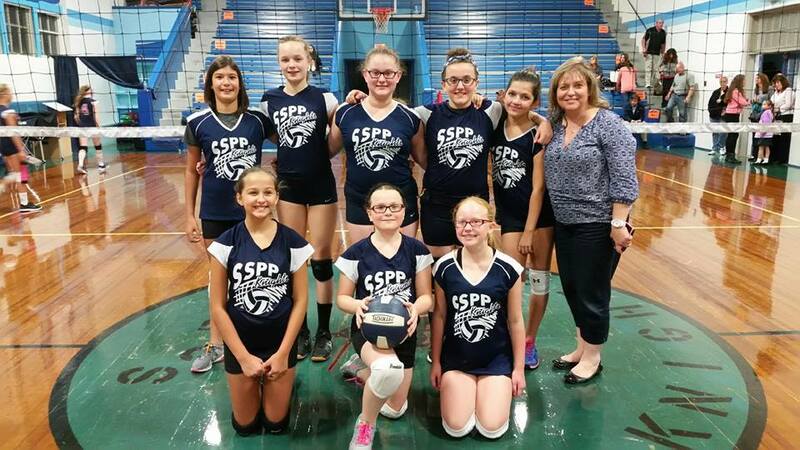 Playoff fever swept through West Seneca last night as the SSPP Varsity White Volleyball team wrapped up their season with some of the most exciting play in the league. St. Andrew’s was in the Knights cross hairs first, with the teams battling for points, with SSPP topping out with a 25-23 win in game one. After dropping game two, an epic battle ensued in the tie breaker game to 15. Down 4-9, a wild serving run tied the game and team work, brought the Knights to victory 15-13 to advance to the semifinals against rival Nativity. With both teams coming off great wins, all the girls fought hard for one more victory. The strong opponent moved the ball well and commanded the serves to defeat the Knight’s hope for another playoff victory. Congratulations to our Lady Knights Varsity White team for a great season full of memorable plays, wild games, laughs and friendships. 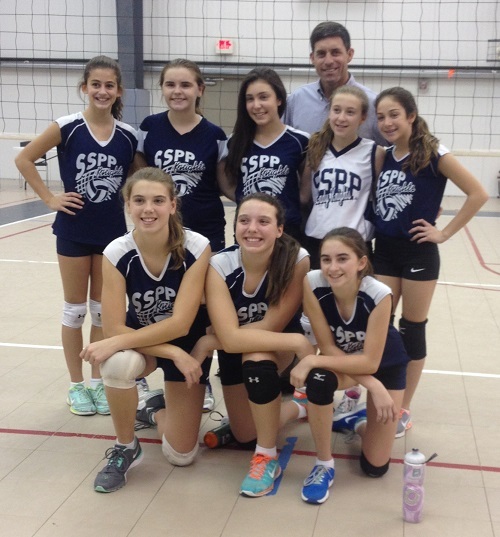 Last week the SSPP JV Volleyball team faced rival St. Greg’s for a double header header at home. The games were all very close and competitively matched, but our lady knights worked together as a team and had incredible serving runs to win both matches! Our JV team remains undefeated with a 10-0 record! A big shout out to all of our players who have worked so hard. Come out and support our last game of the season at home on Wednesday, October 24 at 6 pm. Go Knights! 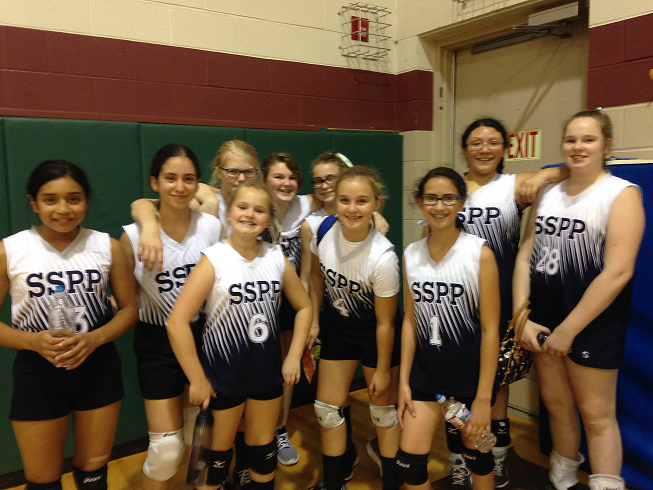 Ss Peter & Paul Varsity White Volleyball team hosted St. Ben’s in their final regular season game of the year. In front of a full house, the Knights fought a grueling battle trading numerous rallies and serves to win 30-28 in a true team effort. St. Ben’s waged a strong comeback to win the second game backed by some powerful serves. But behind some reliable defense courtesy of Mariah and service runs by Kaitlyn and Genevieve, the Knights won the game and match. Carrying the momentum, Oaklie took her turn behind the line with a 6 point run while Savannah, Mariah and Genevieve combined to shut down St. Ben’s by a dozen points. Kaitlyn controlled game two with 10 consecutive service wins with defensive help by Cassidy and Quinn to take the game and match. Lucy and Ashley lent a hand in game three, but St. Ben’s squeaked out the game win. Your Varsity White Lady Knights finished in second place in their division with an 11-3 record. Congratulations girls! Playoffs are Monday. Go Knights! 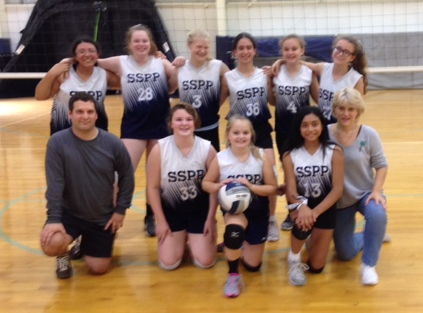 Ss Peter & Paul’s Varsity White Volleyball team had a rewarding trip to South Buffalo picking up two match wins against Notre Dame Academy. Battling for every point and swapping serves, the games were very close. Nice passing from Quinn a positioned Mariah to set Genevieve for a win. In similar fashion, Savannah returned a tough serve, putting it to Oaklie for the put-away. Kaitlyn and Cassidy rocked it from behind the service line while Ashley and Lucy lent a hand at the net. Overall a great team effort for the Knights. Congratulations girls. Final home games this Thursday 7 and 8pm. Go Knights! The JV Volleyball team showed up strong at Niagara Frontier Volleyball Club last night. They won their first match easily against Immaculate Conception. With a great team effort they sealed their second match with a win against far traveled Fredonia. These hard working Lady Knights are still undefeated with an 8-0 record so far! Their next game is here at Ss. Peter & Paul on Thursday, October 18th against rival St. Greg’s. Please come out and support our team. The Varsity White Volleyball team split matches with St. Mary’s of Lancaster in a very evenly matched contest. Great hitting by Genevieve and Cassidy locked in points from service runs by Kaitlyn and Oakley. Strong defense by Carly and Mariah kept St. Mary’s at bay. Support from Ashley and Savannah gave the Knights an edge to take four of the six games., Congratulations girls! Congratulations to the JV Ladies’ Volleyball team who remain undefeated!! Last night the girls took a clean sweep playing a double header at St. Christopher’s School. They won both matches with a wins (25-20, 25-21. 25-16, and 25-12) to make their record 6-0 in league play. 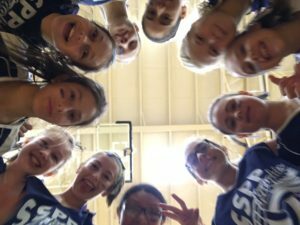 The JV Lady Knights play this Thursday at Niagara Frontier Volleyball Club. Great job team! 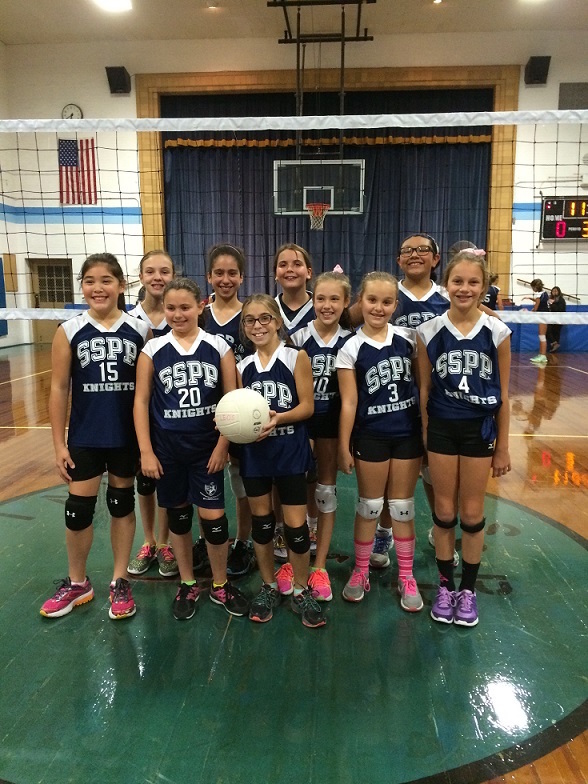 The SSPP JV volleyball team showed up strong Tuesday night in their double header match against St. Amelia’s. Working together proved successful and the Lady Knights won both matches and remain undefeated! Their next match is on Tuesday at St. Christopher’s. Great job team! The Varsity White Volleyball team swept their two matches against Our Lady of Blessed Sacrament this week. Backed by strong service runs by Kaitlyn, Genevieve, Mariah and Oaklie, the Knights captured game after game from the Warriors. Consistent returns from Quinn and Kaitlyn setup Cassidy, Genevieve and Ashley for a couple put-away points. The team came together and rallied to win all six games. Congratulations Girls! The Varsity White Volleyball team played in the Nativity Invitational Tournament this past weekend. Facing teams from across Western New York, our Lady Knights just 7 players strong competed against teams of 12 and 13. Ss Peter & Paul finished pool play in second with wins over St. Mary’s White and Nativity White; losing to dominant Nativity Red by just 5. Team contributions included great service runs by Kaitlin and Cassidy with quality returns by Quinn and sets by Mariah. The quarterfinal became a grudge match against rival Immaculate Conception who beat the Knights in their double header Friday night. Great net play by Savannah and Mariah kept the games close while Cassidy and call-up Carly each provided a half dozen service wins with multiple aces. Oaklie and Kaitlin also contributed to the dominance behind the line, pushing the Knights past IC, 18-25, 25-11, 15-9 and into the semifinals against the 8th grade team from St. John Vianney. Mariah and Carly returned some powerful serves along with consistent sets for hitters Cassidy and Kaitlin to put them away for points. As part of the exciting comeback, Quinn got her first serve over, but the team fell just 2 points short of advancing. Congratulations Knights on your third place finish! The Varsity White volleyball team opened their season with a double header at Nativity in Orchard Park last night. After weeks of practice, the Knights showed off their newly developed skills, like Ashley putting her first serve over followed by a roar of excitement. Dominating serving runs by Kaitlyn, Cassidy, Oaklie, Mariah and Genevieve put the Warriors on their heals and gave SSPP the lead. Great digs by Quinn, Lucy and Savannah stymied Nativity’s serves and contributed to the Knights winning all six games. Congratulations girls! First home match is Friday night. Last night our ladies JV Volleyball hosted our home opener against Nativity in a double header and came out with a clean sweep winning both matches 2-0. Congratulation to our 5th and 6th grade Lady Knights whose hard work resulted in two wins! The Varsity Navy Volleyball team played their final regular season game at Nativity of our Lord in Orchard Park. 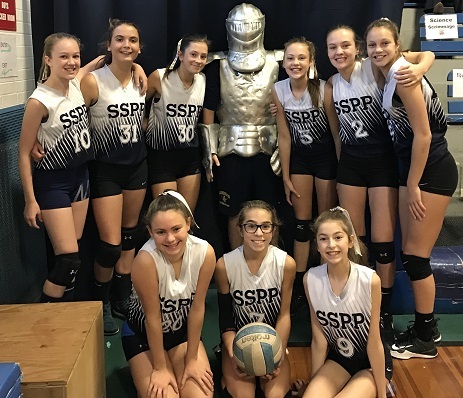 The Knights were ready to defend their second place seed going into the playoffs, starting with strong serving from Jaiden M and Olivia Z. SSPP played some great volleyball, winning points on 7 and 9 sided rallies with tap overs by Victoria N. Isabella A dropping a couple of perfect shots in the hole of the Warriors defense. Amelia M and Sophia Y both ran up the points behind the service line. Ryleigh M continued her continuous game serving streak while Kennedy K passed perfectly for three points. Elizabeth F was a wall at the next, holding Nativity attempted a comeback. The Knights were successful taking their final match and go into Monday’s playoffs next to the top spot. Good luck girls, congratulation on a great season! The Varsity Navy Volleyball team traveled to Queen of Heaven to decide second place in the Stanton Division. 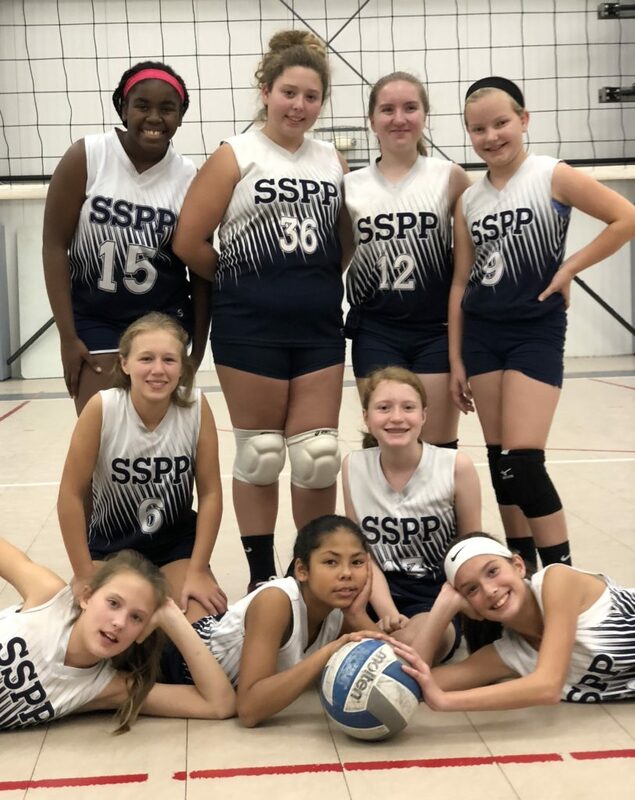 With confidence from their last win against them, the Knights took the lead early with service runs by Amelia M and Jaiden M. Great combos with Ryleigh M passing, Sophia Y setting and Isabella A putting it away gave SSPP the first game win. Queen of Heaven battled back in the second with strong serving and hitting. Elizabeth F and Kennedy K slowed their momentum with a few good stuffs and dumps, but not enough to fend off the win. The grudge game went point for point with good ball movement by Tori N and the consistent serving of Olivia Z. 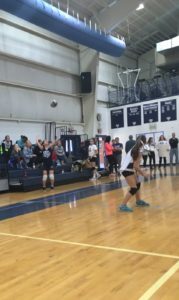 Lengthy volleys showed how well these two teams were matched, so in a true team effort off Isabella’s serve, the Knights took the win to hold sole possession of second place. Congratulations girls! 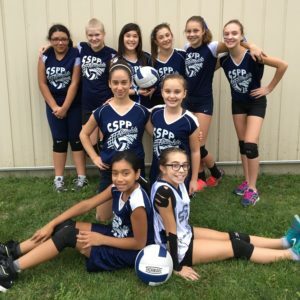 Our 5th/6th grade girls Volleyball team played St. Christopher’s and Christ the King in an exciting double header on Sat. afternoon. The crowd was rocking as our girls won both matches. We had a lot of 3 hit plays and amazing serves from Hannah Z, Kaitlyn A and Makena S. Great defense by Katie A, Macey K and Carly A. A huge cheer went up as Claire T got her first serve over the net for an ace! Our record is 11 wins and 1 loss. Defending their home court, Ss Peter & Paul Varsity Navy Volleyball team hosted Queen of Heaven and Immaculate Conception in their last home match of the season. The Knights battle against Queen of Heaven Eagles was fierce, trading games and forcing the third set. Team wide consistent serving, highlighted by a win point service run by Isabella A and five point by Amelia M, kept it exciting. Returns by Tori N, strategic tap overs by Elizabeth F and great defense by Ryleigh M, clipped the Eagles wings, winning the set and knocking the Eagles out of second place in their league. SSPP now focused on defending against Immaculate Conception’s sea of blue, 14 strong. Quantity did not equal the quality the Knights put on the court, with Kennedy K’s good net play, Olivia Z’s point saving moves and pin point accuracy of Jaiden M’s hitting. Seven point serving streaks by Amelia and Sophia Y, and runs but Elizabeth and Jaiden made quick work of IC, match won by SSPP. Congratulations girls! Ss Peter & Paul visited St. Amelia’s for a double header clash of the Knights. Coming off the high ceilings at the tournament on Saturday in St. Mary’s High School, the Navy team took some time getting used to the small gym and low ceilings of St. Amelia’s. 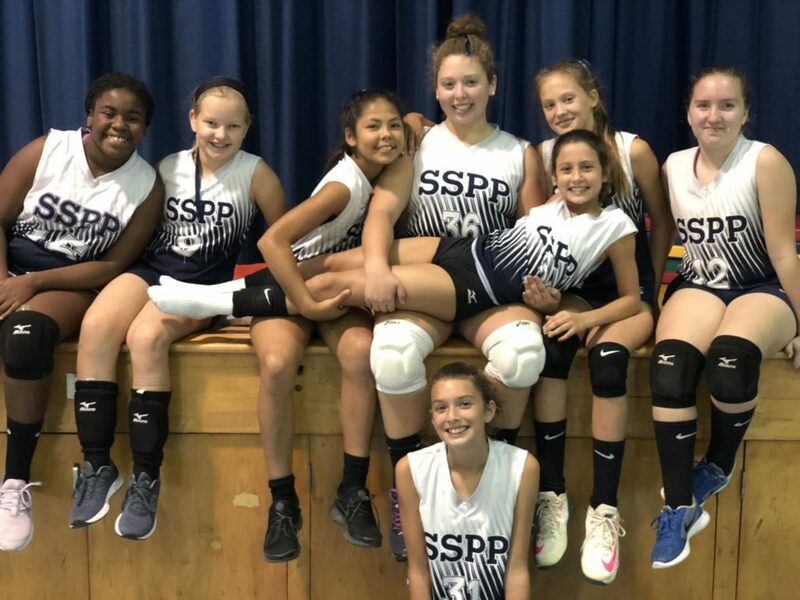 The first game’s point for point battle ended when Jaiden M stepped behind the service line and lasered three aces and 8 points to give SSPP the win. The fun continued with three touch combinations throughout the next two games, and Amelia M adding to the service runs. The crowd roared as Ryleigh M added as much fan fair in a single hit with her ace in game three. Back row passing by Tori N, the high sets of Sophia Y and multiple kills by Isabella A closed out St. Amelia in set one. 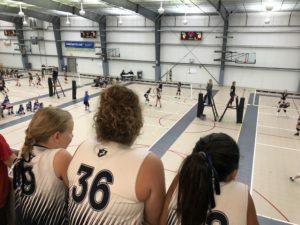 The momentum moved to the second match, with the Navy Knight’s steam rolling over their opponents with great front row play of Elizabeth F and extra effort saves by Kennedy K. Nailing a couple jump serves, Isabella shared in the fun behind the line with Olivia Z, Sophia, Jaiden and Elizabeth. The second match win puts SSPP in second place in their division. Congratulation girls! Final home games will be Wednesday at 6 and 7pm. Please come out to cheer on your Knights! The Varsity White Girls Volleyball team won their division at the St. Mary’s in Lancaster tournament on Saturday; first place in the silver division . The girls all played excellently!!! The Varsity Knights Navy team hosted St. John Vianney in an exciting point for point matchup. Solid digs by Kennedy K and stellar setting by Amelia M positioned Isabella A for multiple kills. A 9 point serving streak by Sophia Y and Ryliegh M’s second night pointing behind the line edged SSPP to win all three games of the match. The second match of their double header against rival Nativity of our Lord pushed the Knights even harder to find their “A” game. Jaiden M and Olivia Z both came alive with 8 and 6 point service runs to pressure the Warriors into many errors. Additional setting support by Tory N to Jaiden and Isabella for momentum changing put aways, elevated the Knights to sweep Nativity in three games. Both Navy and White teams will be playing in the St. Mary’s of Lancaster Tournament this Saturday. Good luck girls! GO KNIGHTS! Walking into a sea of 15 blue jerseys in East Aurora, SSPP’s Varsity Navy Volleyball team sized up their Immaculate Conception opponents as they warmed up. As expected, a point for point match ensued, highlighted with beautiful setting by Amelia M to Isabella A for numerous pin point corner put aways. Elizabeth F was a wall at the net letting Sophia Y go on an 11 point serving streak to quiet the Bulldogs and take game one 25-11. 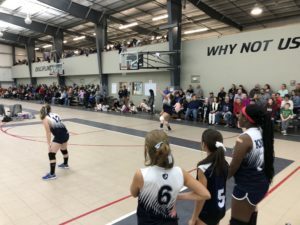 Immaculate Conception battled back in game two taking an early lead until Jaiden M took control from behind the line, powering 13 winners home to take game two 25-12. Ryliegh M earned a huge round of applause celebrating her first service point with an ace. Kennedy K and Olivia Z combined with strong hitting and serving to help the Knights close out the match with a win 25-16. Congratulations girls on a great night! Come see them play tonight at home for 6 and 7pm games..GO KNIGHTS! Our Girls JV Volleyball team did it again! They won both matches against St. Mark’s School last night. Awesome serving by Kaitlyn A, Hannah Z, Oaklie Z and Katie A. Passing was strongly improved and the team set up many 3 hit plays. Macey K and Makena S were the “players of the games”. All the girls are working so hard! Our JV Girls Volleyball team rocked the gym this past Saturday winning all six games against St. Mary’s of Lancaster! 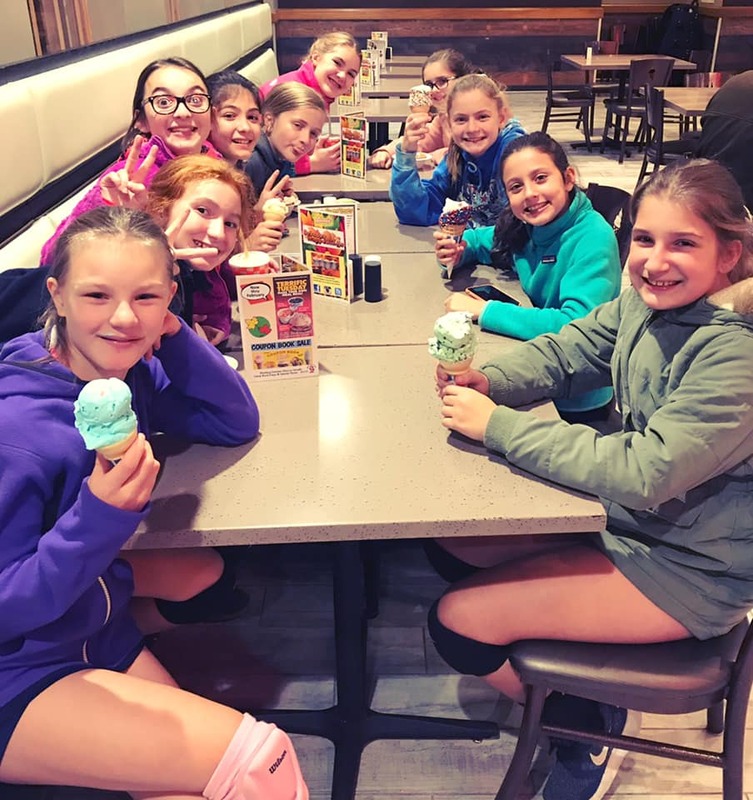 Our team worked very hard to get our three hits and our serving was fantastic! Our players of the game were Carly A and Katie A; great job ladies! Exchanging point for point, the Knights Navy Volleyball team battled rival St. Greg’s to move up in the league standings. Consistent passing by Ryleigh M to Tori N gave Jaiden M plenty of hitting wins with Elizabeth F blocking. Isabella A won 6 in a row from behind the line to squeak out a 25-21 win. Jaiden and Tori’s serves came alive in the second game, with Olivia Z and Kennedy K playing great defense. 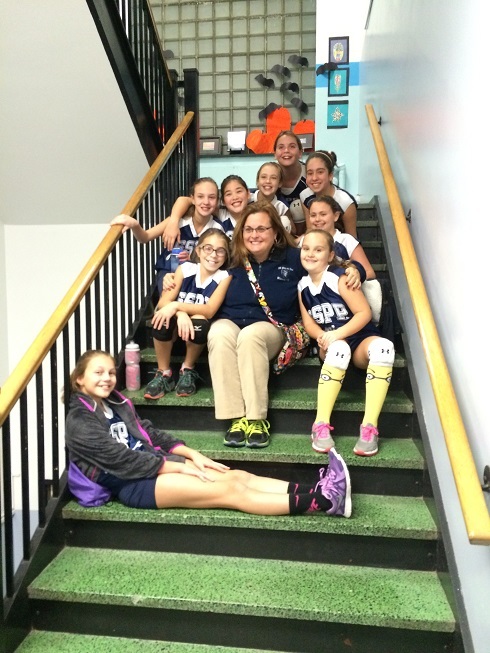 SSPP had many three hit combos, putting the Cougars on their heals and winning game 2. Amelia M setup her hitters for three points while Isabella dropped two at St. Greg’s feet. Sophia Y scored 13 service points to lead the Knights to win game three 25-8. Congratulations girls on the big win. The Varsity Navy Volleyball team hosted their first home game as a double header against rivalry St. Greg’s and league leader St. Mary’s Lancaster. St. Greg’s showed their first game jitters having trouble returning service runs from Isabella A, Jaiden M and Sophia Y, losing to the Knights 13-25. Coming back strong in the second, the battle was on. Exchanging point for point, great net play by Elizabeth Fand quality sets by Amelia M were still not enough as the Cougars snuck out a win 26-24. SSPP came from behind twice to slay the Cougars in the third game with two great service runs by Olivia Z, winning 25-23 and taking the set. A fresh St. Mary’s team exchanged early points with the Knights. Consistent sets from Tory N and good defense from Ryleigh M were not enough to hold St. Mary’s from taking the first two games. 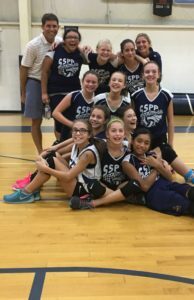 SSPP worked hard in the final game, with super digs by Kennedy K and additional service runs by Sophia, Isabella and Jaiden to win 25-19. With a week and a half of solid practices and hard work, the Varsity Navy volleyball team came out firing at their hosts St. John Vianney. First game service runs by Sophia Y and Jaiden M had the opponents on their heals while teammates Elizabeth F and Olivia Z provided strong front row coverage. Isabella A contributed her streak on the service line in game two with 7 in a row including 3 aces. Amelia M also recorded and ace. Kennedy K’s good hitting and Ryleigh M’s back row defense helped hold St. John’s to single digits in game three. Victoria N secured 7 service wins, helping to give our Knights a sweep for opening day. Congratulations girls on a true team effort. The Varsity White volleyball team swept the Nativity Warriors in both sets on Sept. 20th. First set: Game 1-25-18, Game 2-25-19, Game 3-25-21. Second set: Game 1-25-18, Game 2-25-22, Game 3-25-18. Congratulations, girls! The JV team had a wonderful opening match against St. Greg’s on Sept. 20th. After losing the first match 2 games to 1, they came back and won the match 2 games to 1! Kaitlyn A brought home the win with a rally of serves to win the final game 25-9. Excellent team effort by all the ladies! 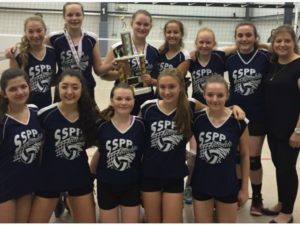 Congratulations to our SSPP 8th Grade Girls Volleyball Team! The team won 2nd place in the Diocesan Championship Final last night. many thanks to coach Anna Benz! Congratulations seventh grade! Thank you coaches Patrick Young and Tracy Allen!